Unlined quilt. Central square of floral chintz with rectangular and chevron border making a larger frame that is set within another square-on-point frame edged with 2 toned red leaf pattererned chintz. 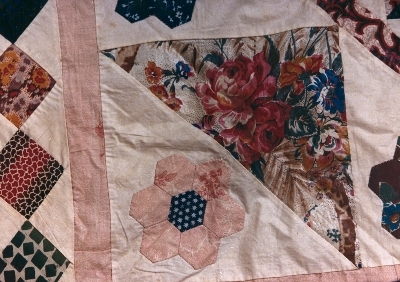 This quilt is mainly pieced (squares, triangles, lozenges) but the hexagon rosettes are appliqued. Dress and furnishing cottons dating from the early 1800s. Raw edged, unfinished. All hand stitched. 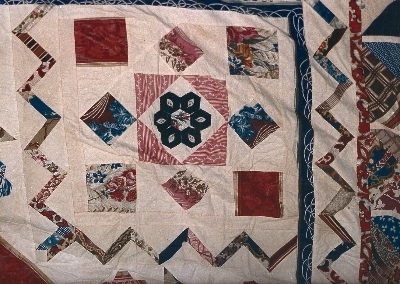 The quilt was made by sisters Eliza (Lizzie) (1845-1925) and Margaret Roebuck (1842-1917) probably on a windjammer plying between India and Australia. About 1860 Henrietta Roebuck took her children from Scotland to live with her brother at 'Jondaryn' on the Darling Downs, Queensland. Neither Lizzie nor Margaret married and when Margaret died in 1917 Lizzie moved to Sydney to live with relations and took the quilt with her. The present owner is a descendant of Lizzie and Margaret's sister Henrietta Maria Howe. 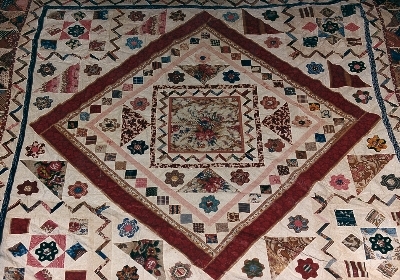 Sisters Margaret and Eliza (Lizzie) Roebuck, who made the quilt, were born in India of Scottish parents, George Douglas Roebuck and his wife Henrietta (Andrew). Major Roebuck was an officer in the 71st Native Infantry of the British Army. He died in 1846 and is buried in India and is said to have died of a burst aorta from yelling at the troops. It is thought that Hentrietta then returned to Scotland with the children. About 1860 Henrietta, with some of the children (including the youngest Lizzie and Margaret) went to Australia to live with her brother James Andrew at his property on the Darling Downs Queensland. Margaret died in Queensland in 1917 and Lizzie went to live in Sydney, taking the quilt with her. The present owner is a direct descendant of Margaret and Lizzie's sister Henrietta Maria Howe.